Okay design police, please don't whack me over the head for this, but I had to veer off a little today and post some fresh finds from the new travel collection from the Gap. 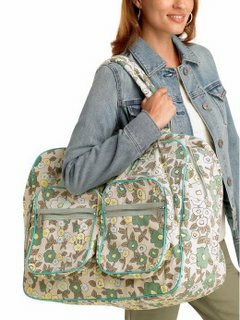 I'm certainly not the authority on Gap bags since I've never owned one, but I simply adore the floral pattern, shown here in blue (also available in pink). I wouldn't trust a $98 suitcase simply because I'm not sure how sturdy it would be for the entire wardrobe that I roll with on vacation, I wouldn't know what it means to pack light. I may really need those shimmer sparkle pants in case we go see this amazing opera or something... I'd have to say 'no' to the suitcase, but the tote...ah how sweet it is, I can totally see myself swiping my visa for that. I think it would be useful for those quick trips you make to your parents' place on the weekends, or the 'trunk driving bag' you always keep packed with the basics in the trunk of your car just in case you end up staying out a little too late, drinking a little too much, and you can't drive home. Your 'trunk driving bag' makes it that much easier to just crash at your b/f's pad. Check out their sassy little passport holder for $12, travel cosmetic bags for $12.50, floral canvas luggage tags for $9.50, and of course, their large floral duffle bag for $68 and wheeled luggage priced at $98. Target Ceramic Vases - Budget Finds!